When I think of Peggy, this quote from John Donne pops into my head. Death is inevitable for all of us humans. It will overcome us one day and that day is never known. I read a book after being diagnosed with a progressive motor neuron disease or atypical ALS or PMA. It was called Tuesdays with Morrie by Mitch Albom. In the book, Mitch has a beloved professor who has been diagnosed with ALS in his twilight years. Mitch begins to spend Tuesdays with him gleaning as much wisdom as he can and showing him his love. I was lucky enough to have a similar experience with Peggy. I had usually Wednesdays or Fridays with Peggy. Our day of the week fluctuated depending on our caregivers, doctors' appointments and overall health. Mitch got an entire year of Tuesdays. I got maybe three months of random days. In those random days, I gleaned wisdom from one special lady, Peggy Mayfield. I reached out to Peggy because having something like ALS is very lonely. So few understand the struggles. Even learned doctors know little about the twisted effects of ALS. So, God put Peggy and me in this boat together and for that I'm so grateful. How did we spend our days? In conversation and sharing meals was our usual setting. Amazingly, I could listen and understand Peggy. I listened to her true feelings about being trapped in her body. It was therapy for us both. We always laughed uncontrollably to the point of tears over the strife of living in our broken bodies. You have to laugh. So as we discussed the latest follies our ALS had gotten us into, we would see the lunacy and hilariousness in trying to survive. Our bouts of bossiness and frustrated rants as we aired them made us realize how comical and surreal this all was for us. The one thing Peggy told me many times was "Sarah, you are so young. I hate this for you. I've had a great life, but you are too young for this." This makes me think of seasons. Every life has seasons: spring, summer, fall, and winter. I met Peggy in her winter season, but she had so much more of a legacy. Peggy's spring was spent in Knoxville, TN where she attended college and had many "Rocky Top" inspired adventures. Her love of the Tennessee Vols was ingrained throughout her life. That orange blood runs through her family's veins still today. She married and lucky for Dyer County settled here. She became a teacher for our local school systems and gave birth to two beloved girls, Tish and Nikki. Summer is always a time of fun and so was Peggy's. Her summer gifted her two more girls, Rhonda and Ruthanne along with a golf loving partner named Bob. Peggy being an avid athlete introduced Bob to many "spankings" on the tennis court. He in turn introduced her to the golf course. Many wonderful days were enjoyed by them on the golf courses of our town and on vacations. Bob discovered Peggy was a natural talent. This talent didn't go unnoticed and she was asked to coach our local high school team. She was voted Coach of the Year by TSSAA in 1999-2000. She was not only a golf coach but like many other coaches was also a valuable mentor to our little town kids. These players never forgot her and how she taught them more than how to drive the ball onto the green. Her fellow teachers and administrators admired her positive attitude, work ethic, laugh, and smile. She was always a team player on the course, in the classroom, at church, and at home. We see the most change in the fall season as the wind chills and the leaves change. Fall is a beautiful season because of the harvest and respite from tasks in the fields. Peggy's Fall was indeed paralleled in beauty. It added 12 grandchildren to her life. Her busy coaching years were behind her and these fall days brought even more joy as she and Bob enjoyed freedom that comes from surviving child rearing years. Watching the grandchildren grow, playing golf, going to ball games, and spending time with family and friends were the colorful leaves of this season. As we know "Nothing gold can stay," and winter was coming. We all have a winter waiting for us in our lives. Some are more prepared than others. As Peggy's winter approached, she and Bob weathered storms together. As their eldest daughter started her chapter in heaven, Peggy discovered she had ALS. On one of my random days with Peggy, she and I talked about losing children. That day was filled with tears because the question of "Why not me instead?" arose. Our bodies are already broken and she knew God had given her so much in her 69 years. If she could have changed places with Rhonda, she would have gladly done so. This is the kind of fabric that made up Peggy's character. As I spent my days with Peggy, she looked back over her life and was deeply satisfied. She told me of times with her children and grandchildren. The one memory that stuck was the story of her oldest granddaughter, Kaylee. She recounted her fun days of enjoying being a grandmother. Peggy loved being outside and gardening. She and Kaylee spent many days in her yard. They planted some lantana a decade ago. If you're a gardener, you know lantana is not conducive to this growing zone, but this lantana still comes back each year. Peggy shared that Kaylee never forgot the name of it and she knew that she was such a smart child from the beginning. Peggy knew she had planted a piece of herself in each of those 12 grandchildren and for that she was very proud. Her family is the center of her happiness and Peggy knew that she had run the race of life with endurance and finished her seasons with stout-heartedness. She was so tough. If you don't believe me, ask Bob. Life. As I look back at my days with Peggy, I know death cannot be proud. Why? Because Peggy did what we should all be doing. She lived. She faced the good times with a beautiful smile and infectious laughter and with audacity she conquered the tough times. Death cannot take her from us. She has put herself everywhere in this world. She will always be in the lantana by the drive that miraculously comes back each year. She is on the local golf courses and others she visited. She is at her church where she faithfully attended. She is in the children she helped throughout her teaching and coaching career. She's in the smiles of her children and grandchildren. She's in the curls of their hair. She will forever be in the heart of her soulmate Bob. Peggy closed her eyes but a moment and now is on the other side, heaven. She conquered death and being the fierce competitor that she is, she beat us to the other side. Death is conquered once again. 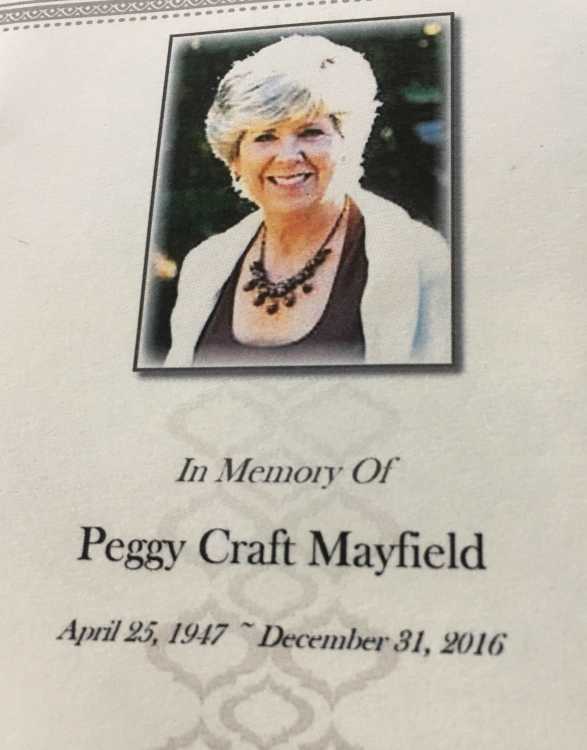 Today, we will let Peggy's earthly body rest, but within your own chests we will let them swell as we feel and cherish the piece of Peggy she gave each of us. We will carry that always. Beautiful, Sarah!! "She conquered death and being the fierce competitor that she is, she beat us to the other side."